Thank you for the opportunity to provide "Sample Country Club" with our water audit services and this final report. On the following pages you will find detailed information regarding all of the irrigation components that I evaluated while on-site August 12th &13th. I’ve also included the Distribution Uniformity results from the catch can tests and the pressure test graphs. They are located within the report below the primary descriptions and analysis. I begin with the Audit Purpose, an Executive Summary and conclude with my recommendations. Thank you to you and your staff for taking the time to assist me with the testing and to answer all of my questions. There were two main purposes for the water audit. One was to try to determine the cause of the poor sprinkler coverage that has resulted in dry areas and inconsistent turf quality. The other purpose was to quantify actual water usage given the large amount of valves and sprinklers that have been added during the different construction phases. There is a major concern that current irrigation demand is at or beyond the capacity of the pump station. The future addition of eleven more acres of transitional turf on the east side may further overburden pump capacity. At this point in time, water availability is not an issue. The key concern is that pump capacity and main line sizing are considered to be the limiting factors to sustainable growth. The irrigation system was installed in (Date). With the exception of sprinklers, the irrigation system is (x) years of age. The golf course, clubhouse area and the additional 11 acres of turf on (front nine) have been built in stages. The additional stations and water use is not programmed in the central computer. Total turf encompasses (x) acres. This large amount of acreage makes irrigation timing and control difficult. The result is higher demand from the pump station and the creation of a long water window during the peak irrigation season. The Irrigation central has limited capabilities and there have been no software upgrades for ten years. Furthermore, eight satellites are problematic and failing to communicate with the central. It is imperative to upgrade the control system including all clubhouse area satellites. GPS mapping and a sprinkler inventory should be followed by programming all irrigation data into a new central computer. Catch can tests for Distribution Uniformity (D.U.) proved that an upgrade to the Toro 800 series conversions will improve D.U. and course conditions. It is most likely that less water may be required while simultaneously improving turf conditions from tee to green. Test results also show that the D.U. is worse at night compared to the same test performed during the day. Sample Golf Course is a prime candidate for a turf removal project. Many rough areas and turf surrounding tees are out of the course of normal play. Removing turf will decrease water use. Main line pressure tests conducted during the nightly cycle indicate that there are some pressure drops that are of concern and could be a factor in poor irrigation performance. The main line gate valves are no longer reliable and future replacement should be planned. 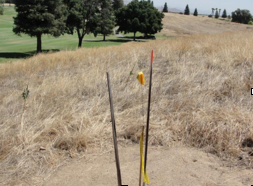 Based on the age of the underground piping and wiring, Sample Golf Course should begin planning and budgeting for an irrigation system replacement in the next 5-10 years. Based on the actual water use and future projections, the pump station is capable of meeting water demand but only if Sample Golf Course proceeds with the control system upgrade, inventory and programming. 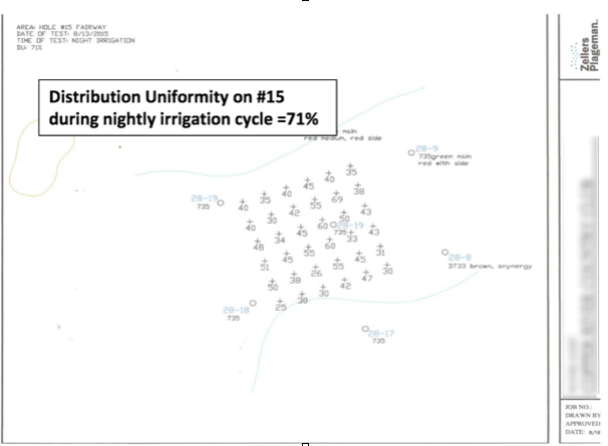 For detailed information, please refer to all irrigation components in the subsequent sections of this report. *projected flow does not match actual flow. Note: After a review of the central, it is evident that only the golf sprinklers have been programmed into the central computer. Clubhouse areas and the added turf water usage data are estimated based on valve sizes and sprinkler/nozzle types. Many golf sprinklers have been removed and replaced by an electric valve to irrigate the turf adjacent to homes on the west golf holes. As previously suspected and now documented, there is a large variance in the numbers. The estimate usage at the clubhouse and added turf is 90,000 gallons per night. This accounts for only 25% of the variance. With such a large variance it was obligatory to check the actual flow of the sprinklers. This was accomplished by turning on multiple sprinklers of the same type at the same time. While the sprinklers were running we recorded the flow meter in Gallons Per Minute (GPM) inside the pump station. The flow meter number divided by the amount of sprinklers running provide the average GPM per sprinkler. We turned on (16) 730 sprinklers. The flow meter varied from 790-860 GPM. In the central all sprinklers were programmed at 24 GPM. According to manufacturer nozzle charts the 735 V.I.H. sprinklers with 65 PSI regulators should deliver 27.4 GPM. However; with the additional third nozzle adding 4 GPM, each sprinkler should distribute water at the rate of 31.4 GPM. Note: It is presumed that the flow meter is accurate but it is possible that the meter may not be providing precise flow rates. At this point in time an explanation regarding the extreme variance between 31.4 and 49GPM is unknown. Further testing is needed to check gallons per sprinkler. This leads to the conclusion that the amount of water running on the entire property is a great deal more than the amount projected in the central. The variance can be attributed to the clubhouse, added turf and the actual sprinkler flow. Without 100% control from a central, scheduling an efficient / optimized flow during the nightly cycle is extremely difficult if not impossible. Following the test, (Superintendent) changed some of the central data to reflect the higher amount per sprinkler. The projected amount increased greatly as did the watering time window. As of this report, turf conditions appear to show a slight improvement. This may be attributed to the decrease in variance from projected to actual flow. Staff will continue to monitor and compare actual flow during the night to the projected flow in the central. Using the 2,800 GPM number set as maximum flow in the central, the pump station is capable of pumping 1,680,000 during a ten hour water window. Based on the current actual flow of 1,182,000, the pump station should be capable of producing enough water to handle existing and future demand following the turf addition on the east. However; it is imperative that ALL water on the property be controlled by a central irrigation computer. There is an existing well pump located on hole #16. It is capable of pumping in excess of 300 GPM. It is connected to the main irrigation line as well as the lake fill line on #17. At this point in time, the pump is not needed for irrigation use but it should be considered an alternative source in case of emergency. Should it be used as a booster pump for pressure, it would not be detrimental to the existing system. In order for it to be used as a booster, upgrades to the pump and controls would be needed. Further evaluation would be needed to determine specifications should this source be required for use. Gate valves are located on the main irrigation lines. The bottom portions in the gate valves have accumulated sediment. The sediment is preventing complete closure of the valves when needed. This problem leads to staff needing to shut down the entire pump station in order to make main line repairs. There are six crossovers planned for development on the east side. The crossover points would be ideal locations for gate valves located on both sides of each crossover. The irrigation central and software is ten years old. (Irrigation Manufacturer) has not released any updated software in that time period. The software is limited to only five programs. This limitation prohibits staff from controlling the many different turf areas as is typically needed on a golf course. The hydraulic flow zones within the software were originally programmed on a hole by hole basis. The hydraulics in all irrigation centrals is a critical element that helps regulate flow of all watering from the central. Hydraulic zones should be created for each lateral pipe if possible. The current hydraulic zones could be a contributing factor to low pressure areas during the nightly cycle. It was also evident that it is not possible to run the nightly cycle without a low gallon flow during the last several hours of the cycle. This long low flow is called a tail and can cause the pumps to run excessively due to a longer water window. Efforts to decrease the tail have been futile. The accuracy of projected flow compared to actual pump station flow is dependent upon the database having updated sprinkler and nozzle data. Under most circumstances, I would advise that all added turf stations on the west side be programmed into the central. It would also be best to inventory all satellites and stations. With that data all correct sprinklers/nozzles and area irrigated can be programmed correctly. There are 34 satellites on the golf course that are connected to the central computer via a communication wire path. Each is capable of running up to 51 stations. Currently most satellites are maxed out and control approximately 70 sprinklers. The golf course satellites have become problematic. During the on-site audit, eight satellites were not communicating to the central. Repair parts have increased and are becoming difficult to locate. These satellites require staff to make program and run time changes manually in the field. This is time consuming and difficult to schedule on a daily basis. 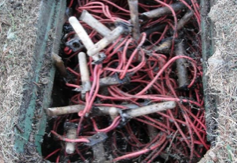 All sprinkler wires were run to valve boxes adjacent to the satellites and all splices were made in the valve boxes. Multiple stations control 2-3 sprinklers on fairways and roughs. Fortunately these multiple stations can be broken up in order to irrigate more efficiently. There are six additional stand-alone clocks on the property that are not connected to the central. (See List Below) The two in the cart barn can be combined into one satellite. In 2005 (Sample Golf Course) replaced the original (x) series sprinklers with the Toro full circle 730 series. Previous to 2005 many versions of the (x series sprinkler) were tested and failed to perform adequately. All sprinklers that I looked at were outfitted with the green (#35) main nozzle, red (quad) rear and a third side nozzle for medium range distribution. Full circle sprinklers are located on most rough areas including turf edges where part circle sprinklers would be more appropriate. The 730 series was introduced in the early 90’s and discontinued in 2004. The 730 sprinkler was manufactured with (1) main nozzle and (1) rear nozzle. 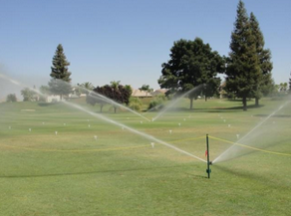 Since the 730 was introduced golf courses experienced dry areas around the sprinkler. Typically the dry areas developed approximately 5-15 feet away from the sprinkler and were more prevalent on the downwind side. Toro believed the problem was caused by the rear nozzle and an effort commenced to improve the sprinkler by manufacturing a new rear nozzle. This attempt continued for quite a few years and over time, they introduced at least six versions of the rear nozzle. The red quad nozzles are the most recent and last to be manufactured. They have proved to have the best distribution pattern. In an effort to improve the performance of the 730, Toro began manufacturing the third nozzle. During the catch can tests, and on several other holes, the pressure out of the nozzles was tested on numerous sprinklers. The pressures ranged from 65-69 Pounds per square inch (PSI). These pressures are fairly consistent and direct evidence that the regulators within the pilot valve assembly are set at 65PSI and are performing adequately after 10 years of use. It is my opinion that these percentages are vague and leave room for interpretation by the auditor and the client. According to my research regarding the establishment of these percentages and performance, they were adopted in the late 1990’s. At that time period golf sprinkler technology was not as good as it is today. Expectations of sprinkler performance at that time were not as high as they are now given the cost and availability of water. Longer station run times create longer water windows and result in higher pump electricity expenses. Area of Catch Can Time of Day Sprinkler Type D.U. We chose to perform the test on #15 fairway since it is representative of a fairway that has the typical dry patterns as seen on most other fairways. The graphic above shows the location of the catch cans. This graphic shows the numeric catch can results from the night time test. Since the other two tests were in the same location, they were not put into a graphic format but the results are listed above. The daytime test, 76% is in the good range. The nighttime test on the same area resulted in a lower D.U. of 71%. The variance is due to the fact that during the night, there is much more water being pumped across the entire property. Hydraulic flows are more erratic and the main lines are subject to more pressure loss. While on site we decided to compare the older technology of the 730 to the newer 830 series conversions. Following the nightly test with the 730 sprinklers, staff changed all sprinklers in the pattern to the 830 series. The result is a much better D.U. of 86%. It should also be noted that the 830 series not only performed better, but they distributed less water out of the nozzles according to manufacturer data. The 800 series performs better and may result in less water needed in order to achieve more consistent turf conditions. Given the current central software and large amount of sprinkler data not in the central, these results provide a valuable baseline from which future comparisons can be made. Distribution Uniformity can and does change due to many factors. The purpose of the main line pressure test is to record the pressure in the irrigation system main line before, during and after the nightly irrigation cycle. Pressure is recorded every two minutes while the recorder is connected to the system. When looking at the graph, pressure in PSI is on the left/vertical side and time of day on the bottom/ horizontal. 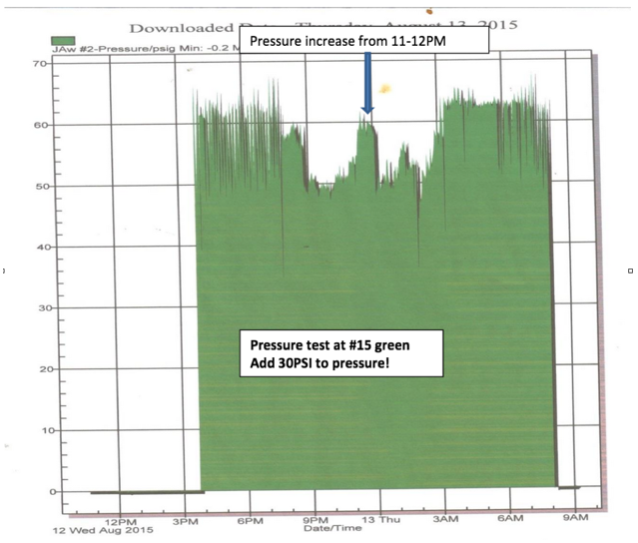 Results reveal low and high pressure along with spikes in pressure. The test can also reveal If the pumps cycle on and off frequently. Cycling is an indication of leakage from piping, sprinklers or valves. At (Sample Course), two recorders were used to record pressure. Green #2 was chosen due to its’ higher elevation. Green #15 was also chosen because of its relative distance from the pump station, and we were conducting the catch can test on the same hole. 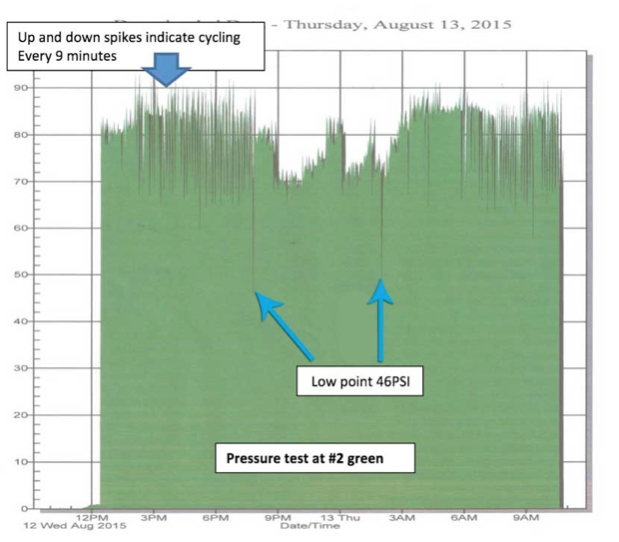 The average pressure during the nightly cycle was 74PSI. There was a low point of 46PSI which lasted for 4 minutes. The higher pressure shown from about 11:20PM lasted for 40 minutes, then pressure went back down to the 70PSI range. A flat pressure curve is desired. The fluctuating pressures may be attributed to irrigation use by clubhouse, added turf and lack of hydraulic control at the central computer. The turf and grounds at (Sample Course) encompass 180 acres. After observing the entire golf course, it is my opinion that there is good deal of acreage that appears out of play and could be removed. Turf removal can also be called Landscape enhancement and when done correctly, often beautifies the golf course without affecting the course of normal playability. Areas where turf is removed can be replaced with mulch, native soils or in some cases, native drought tolerant grasses. 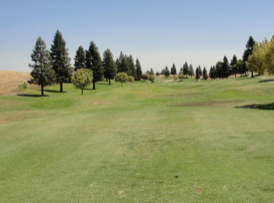 There are numerous golf courses in southern California that have gone through the process due to the lack of available water. They were fortunate enough to have received rebates from the Metropolitan Water District, which paid for the entire project. Water availability is not yet a problem at (Sample Course). As development continues and should there be added irrigated turf or another nine holes built, available water will become an issue. The main benefit to turf removal is less water use and a decrease in pump electricity expense. Some of the ancillary benefits include less expense for: Fertilizer, Pesticides, Labor, Fuel, and Machinery. The pump station is the heart of the entire irrigation system. It is crucial to continue preventative maintenance on a timely basis. The 10HP submersible pump should be scheduled for repair. Pump efficiency testing should be conducted by a certified testing contractor in order to monitor pump performance. (Sample Course) should begin planning for an irrigation system renovation in the next 5-10 years. At that point in time the system will be in the renovation time range as recommended by the ASGCA. 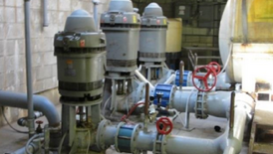 Existing problematic gate valves should be changed out sooner in order to achieve complete area specific isolation when needed for system repairs. As development plans continue on the eastern holes, specifications should include two new gate valves, one on each side of every crossover point. On the positive side, newly installed components such as satellites and entire sprinklers, may be salvaged and re-used to decrease renovation costs. The pump station may need some technological upgrades, but if it continues to operate efficiently, a complete replacement will not be necessary. It was brought to my attention that (Sample Course) has been discussing a complete satellite and central upgrade. I agree that this upgrade is needed for several reasons. A new central with the latest software will enable staff to have much better control over irrigation. Site specific programs will help distribute water precisely when and where it is needed. The hydraulic flow zones can be programmed for optimal flow across the entire property. Most of the double or triple sprinklers wired together can be broken up in order to obtain more individual sprinkler control. All of the stand-alone controllers not currently controlled by the central can be converted and all sprinkler and valve data programmed and controlled by the central. Based on the results of the catch can tests, I recommend (Sample Course) to upgrade to the Toro 830 series conversions. The sprinkler bodies appear in good operational condition and the conversion assembly is a lower cost, quick upgrade. The 830 conversion with the #33 brown nozzle should have adequate radius in order to achieve sprinkler to sprinkler distribution. The 830 at 65PSI should distribute water more efficiently and at a lower, (24.4) GPM. Consideration should be given to converting full circle sprinklers, located along turf perimeters, to an adjustable part circle. 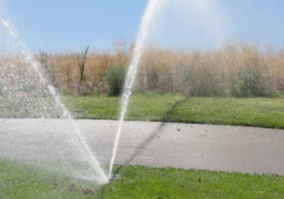 If water is needed on the rear side for turf, a nozzle can be installed for short range irrigation. Should budgets not allow for an immediate upgrade, purchase sufficient quantity for an entire fairway and monitor the results. Given the age of the sprinkler bodies, pilot valves and piston valve assemblies, a complete (whole good) replacement of sprinklers may be a more cost efficient upgrade path. This can be determined in the near future and will require constant monitoring of sprinkler problems and part replacement costs. Occasionally, The Toro Company offers severe discounts on complete sprinklers. Discussion with the local Toro distributor should commence to plan the most cost effective upgrade. Following any future upgrades in the control system and central programming, the same pressure tests are recommended on the same areas. Although it is mentioned in control system recommendations, I do think pressure is a direct result of central programming and having accurate data programmed. Both catch can and pressure tests are now documented and a basis for future comparison. I recommend GPS mapping of every sprinkler, valve and course features. Over the last 10 years there have many changes made to the golf irrigation system. None of these changes have been documented and programmed into the central. At this point, the original irrigation design plan is useful to a limited extent. A final GPS map / As-Built was never performed. A complete GPS inventory will benefit (Sample Course) by providing an up to date irrigation map. In addition, all sprinklers, nozzles and valve data will be collected and can be used to program the new central irrigation computer. If new satellites are installed and station wires broken up for added control, the GPS mapping should take placee prior to installation. The reason for this is so that station sequencing can be performed prior to satellite wiring. This makes the process more efficient and leaves no room for error. The only other option I recommend is to perform an inventory audit on paper. Although it is less expensive, the final product is only useful for programming purposes. There is no up to date irrigation map provided. In conclusion, thank you again for the opportunity to perform a Water Audit analysis for (Sample Course) C.C. Please feel free to contact me if you have any questions regarding this comprehensive report or need any additional supporting documentation. We look forward to assisting (Sample Course) C.C. in the implementation of any or all of the detailed recommendations.